In our last post, we talked about the five ways to cut your energy bills with your water heater. In this week’s post, we’ll focus on the last of those five – using less hot water – in more detail. The average American household uses about 70 gallons of hot water every day (think about the storage tank on your water heater, then imagine one and a half or two of those …that’s a lot of water to heat!). Fix Leaks – You can significantly reduce hot water use by simply repairing leaks in faucets, showerheads, and pipes. A one-drip-per-second leak wastes 1,661 gallons of water and can cost up to $35 per year, according to the US Department of Energy. Install low-flow showerheads – Up until 1994, shower heads had a standard flow rate of 5.5 gallons per minute (gpm). Since 1994, that flowrate has been reduced to a maximum of 2.5 gallons per minute (some go as low as half that). If your showerheads predate 1994, you can purchase a quality low-flow replacement for under $20 and cut your hot water usage by 25-50 percent. Replace your faucet aerators –The aerator (the screened, screw-on tip at the end of your faucet) determines how quickly water will flow from your faucet. Most modern kitchen faucets have aerators that restrict flow rates to 2.2 gallons per minute (gpm), while new bathroom faucets have ones that restrict flow rates from 1.5 to 0.5 gpm. Aerators take less than five minutes to replace, and by swapping your 2.2 gpm with a 1.0 gpm model you’ll cut your hot water consumption in half. Just bring the aerator you’re replacing to the store so you know you’re getting the right-sized replacement. Use the cold water setting for clothes washing – Most of today’s detergents work perfectly well in any water setting. If you still feel you need to use hot or warm water, make sure you choose the right load setting for the amount of clothes you’re washing. Consider a tankless water heater –A big part of the energy cost associated with hot water comes from RE-heating it – a flaw inherent in water heaters that use a storage tank (your water stays in the tank – usually in a cold basement – where it needs to be continually re-heated until it’s used). A tankless propane water heater, on the other hand, heats water instantly on demand, so you only pay to heat the water you need. It also has no pilot light, so you won’t pay to pay for that gas, either. The bottom line: It’s easy to cut down on hot water use without sacrificing your comfort or quality of life at home. Follow these tips and you’ll find your energy bills shrinking month after month! 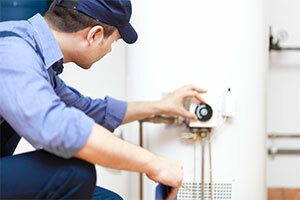 Considering a water heater upgrade? We can help! Contact us today to get a FREE, no obligation estimate on a conventional or high-efficiency tankless propane water heater for your North Carolina home!